On Wednesday 29 October ABYC hosted 20 NMMU students to a sail. Prior to the event Professor Paul Webb whispered on the NMMU grapevine and found Schalk du Plooy of Botany to be the student representative. A application form was placed on the ABYC web site, Schalk put out an ‘all students communiqué’ notification with the website address and within seven minutes all places were taken! On the day Port Elizabeth, as always, obliged with enough wind for some exciting sailing on yachts that graciously offered berths to the students, that included; Fling, Sewen, Jellybaby, Malgas, Wild Thing, Chinook, Lady, Talisker and Warrior. After two hours on the briny a group of very happy (sometimes wet) students staggered back on to dry land. Boerewors rolls supplied by the club, member-priced beer, as well as prizes such as tee shirts for the ‘most scared’ and ‘most wet’ students, rounded off the evening. Students and people wishing to learn to sail are encouraged to join the club and experience the many facets of this fascinating sport – sail training takes place for all members on a Saturday morning. 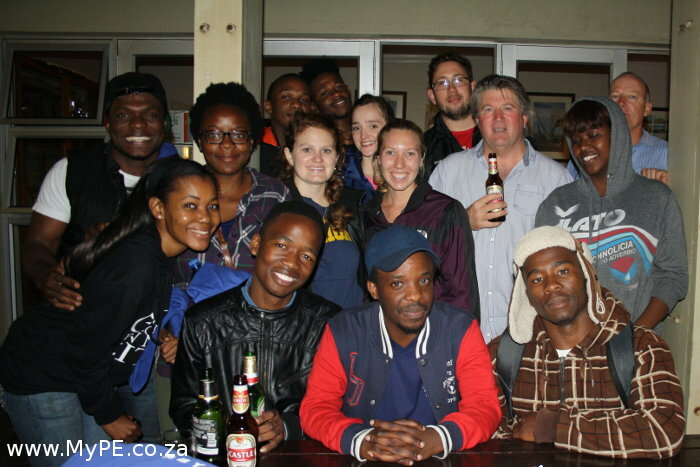 Some of the 20 strong NMMU Student contingent that experienced the world of sailing on Wednesday 29 October.